From the Dog & Partridge on the junction of Palmerston Street and Wellington Road, Adlington Road runs down to the town boundary with Adlington parish. This is just beyond the last house in the street. All the properties are fine stone cottages with two terraces at a right angle to the street and one detached cottage down beside the river. The area, including the Recreation Ground, is known as Gnathole. On the west side of the street find the ten mile long Middlewood Way, the old Macclesfield, Bollington & Marple Railway, which has been converted into a recreational area for walking, cycling and horse riding. The ranger station and car park are located in front of the viaduct. Access can be made by steps from the back of the car park. Access is also available to/from the Waterhouse estate and Wellington Road. Beside the car park there is an older children’s play ground with an excellent and very popular skate board ramp and a basket ball net. Younger children will find play facilities at Coronation Gardens. On the east side of Adlington Road is the main entrance to the Recreation Ground which contains cricket and soccer pitches together with tennis courts and a bowling green. In Adlington Road you will find the old Conservative Club, now the headquarters of the Bollington Group. Adlington Road continues towards that township via Lodge Brow (notes on Brows), named after the farm at the top of the short hill through the wood, and Sugar Lane. Approach off Palmerston Street, Wellington Road or from Sugar Lane. 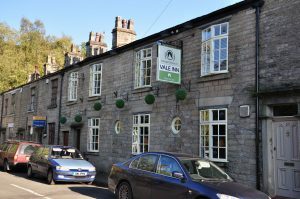 Nearest pubs – Vale Inn in the street, Dog & Partridge. The Leasehold land … of the … Title filed at the Registry and being 3 Adlington Road, Bollington SK10 5JT. (SPD) Bollington Conservative Club (now occupied by the Bollington Group, Adlington House); Mid 19th century Gothic.